With MKP 4F WIMA has introduced a new range of filter capacitors based on metallized Polypropylene (PP) dielectric. - Nominal voltages from 230 VAC to 440 VAC. - Attenuation of transient voltage pulses caused e.g. by switching. WIMA filter capacitors are designed on the basis of low-loss Polypropylene film and exhibit high AC current capability at high frequencies as well as low ESL and ESR values. The 440 VAC range has an internal series connection and stands out for an increased corona discharge inception voltage. WIMA capacitors are produced with the proven box technology using solvent-resistant, flame-retardant plastic cases according to UL 94 V-0. They are environmentally compatible with the RoHS 2011/65/EU regulations of the European Union. TAW is now offering fuses, fuseholders, fuseclips, fuse blocks, circuit breakers, resettable fuses and accessories from OptiFuse. 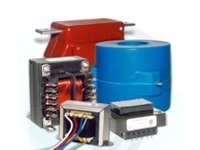 OptiFuse is a manufacturer of over-current and over-voltage protective devices. The company is headquartered in El Cajon, CA and maintains a satellite office in Taipei, Taiwan and Riyadh, Saudi Arabia. OPTIFUSE was founded in 2000 as an alternative manufacturer to the more established brands of Bussmann and Littelfuse. Prior to 2000, OptiFuse had designed and manufactured approx. 150 different products for Bussmann, Littelfuse and Ferraz-Shawmut under the name of Basic Power Engineering and Manufacturing. All of OptiFuse products are RoHS compliant and/or lead-free. Many of the parts are listed or recognized by UL and/or other international safety organizations. TAW is now distributing transformers from MCI which is specialized in magnetic component manufacturing of catalog and custom transformers. 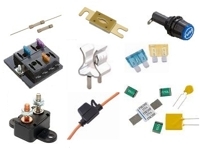 A wide range of magnetics from power transformers, chokes, class 2 transformers, UL 60601-1 medical certified transformers, current, toroid, and AC & DC switch mode with configurations of horizontal and vertical pc board or chassis mount is provided. The products are UL, CSA and TUV-CE certified. Give us your transformer part numbers and we will be happy to get a cross for it and price quote. We look forward to all your request! Piher International Corporation has announced the immediate availability of a new shaft angle rotary sensor – the PST-360 Through-Hole Position Sensor. The PST-360 combines a through-shaft design with 360º absolute position feedback in an extremely thin package. Key features include a through-hole design where the sensor fits over existing shaft and bearing assemblies. The new sensor incorporates a proprietary ring magnet with a fully sealed Hall ASIC as the sensor element. This combination is truly non-contacting and does not rely on gears or other interfacing parts and therefore matches the durability specifications of the final application. The proprietary design provides a streamlined sensor with only one moving part along with programmable electronics designed for harsh environments. The result is an exceptionally small form factor, cost-effective product. Measuring just 9.8mm thick with a body diameter of 37mm and 50.0mm mounting hole spacing, engineers can now integrate a fully featured rotary sensor directly on their existing shafts without the packaging issues that typically accompany encoders or other through shaft sensing devices. The standard model features a rotor with a 14.05mm inside diameter (double flatted) shaft design. Other custom rotor configurations are available from PIHER to adapt existing OEM shafts to the standard PST-360 Sensor. The PST-360 is an extremely robust design with fully encapsulated electronics surrounding the durable ring magnet, allowing for use in high humidity environments. Unlike optical encoders, it has no sensitivity to dust or dirt and can tolerant high vibration cycles as the ring magnet never comes into contact with the sensing electronics. The new device offers electrical angles up to 360° with no dead band and linearity error as low as ±0.5%. Rated for use at -40ºC to +85ºC, optional models are rated up to 150°C. The sensor can be programmed with full scale output with angles as narrow as 20 degrees. The device supports most common electrical signal outputs with minimal investment. Optional outputs include: Analog, PWM (12 bit) or Serial Protocol (SPI) at 14 bits and includes a second output channel to provide a programmable switch signal. Redundant versions are available with duplex, triplex and quad redundant versions all within the same package size. With its integrated redundancy, the new sensor is ideally suited for use in a wide range of off-highway, construction and agriculture equipment drive-by-wire applications. It can be easily adapted to fit marine outboard steering and throttle control, robotic controls, material handling, electronic braking systems, automation equipment and medical devices. “The PST-360 provides a breakthrough in terms of simplicity, size, cost and robustness, especially when compared to existing absolute angle sensors and encoders,” explains Paul Cain, Piher International’s General Manager for North America. “The propriety Hall design incorporates a rotating ring magnet as the sensing source, allowing for the smaller package and simplified electronics that are easily integrated into the final customer’s product”. Please contact TAW Electronics, Inc. if spec sheets or samples are needed for evaluation. 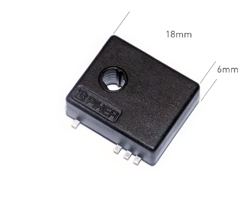 Piher North America has introduced the non-contacting PSC-360 programmable Hall effect magnetic sensor featuring a switch function not found in other 360º absolute position sensors. The switching point can be programmed at any angle allowing maximum design flexibility. It can also be used as a indicator for multi-turn applications. This unique low current switch design incorporates both on and off positions that provide a secondary position verification for improved safety, especially important for mission-critical applications in harsh environments. The PSC-360 Sensor also offers high temperature capabilities with operational performance between -40ºC to +150ºC and high accuracy over 360º at 0.5%. 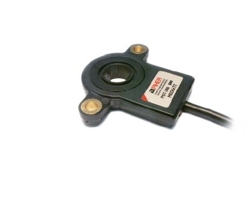 The bushing/panel mount style sensor features a standard ¼ inch ‘D’ Flat shaft, in a low profile package of only 13 mm extremely advantageous for applications with tight packaging constraints. The technology used by Piher breaks through the traditional magnetic fluxuation and complex circuitry barriers. Piher’s technology is only sensitive to the flux density coplanar with the IC surface, which eliminates those problems and optimizes accuracy for absolute position feedback from 0 to 360 degrees. The simple, low-cost package maintains a true non-contacting air gap between the rotating magnet and the fixed sensing system. Designed with the permanent magnet as the only moving component, the PSC-360 sensor provides a mechanical life of up to 50 million cycles. Further durability is incorporated with the fully sealed magnet and the sensor’s electronics (sensing system) encapsulated in molded plastic, providing a completely sealed IP67 rated sensor that is totally impervious to humidity. These features are ideally suited to harsh environmental exposure where shock, vibration, high humidity and dust are unavoidable. Piher’s technology is not only true absolute - maintaining the sensor’s true position even after a power interruption, it also offers full redundancy achieved with a dual core version within the same housing. The result is a highly configurable sensor that offers an excellent solution for the severe conditions found in industrial, food processing, agriculture and off-highway applications. Specific uses include hand throttle control and throttle position feedback, accelerator and brake pedals, wheel angle for off highway vehicles and tractors, farm implement position feedback, forklift lift and tilt control, suspension height, marine, cranes and airport ground support vehicles. Other PSC-360 performance characteristics include linearity of ±1% absolute (0.5% upon request), selectable analog (ratiometric), PWM, or serial protocol, up to 14 bit angular resolution, 40 bit ID number, and self-diagnostics. With the PSC-360’s modular architecture and Piher’s custom engineered technology capabilities, Piher can modify electrical characteristics, mechanical characteristics, and connector configurations to meet customer specifications. For example, Piher can provide the same full scale output over as short an electrical angle as narrow as15 degrees. The PSC-360 is priced under $30 each in production quantities with immediate availability. Piher International Corporation has announced the immediately availability of the non-contacting MTS 360 SMD Rotary Position Sensor. The MTS provides a true breakthrough in sensor technology by combining a through-shaft design with 360º absolute position feedback in an ultra miniature size. 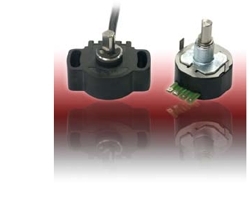 The result is the smallest fully featured rotary sensor on the market with reliability up to 25 million cycles. With its tiny size of only 6mm x 17mm x 18mm (HxWxL), engineers can now integrate a fully featured rotary sensor directly on their PCB without the packaging issues that typically accompany encoders or other absolute position devices. The exceptionally low profile fits easily in places that were previously too small for pre-packaged rotary sensors. The MTS 360 relies on patented Hall effect technology to enable for the first time, true non-contacting through-hole shaft sensing using standard SMD features. The offset through-hole accommodates the vacuum pick up tool, allowing use in automated SMD assembly systems. The standard model features a 4mm double D-flat shaft and an (8) pad SMD footprint that is compatible in most reflow soldering systems. The new device offers electrical angles up to 360° with no dead band and linearity as low as ±0.5%. Rated for use at -40ºC to +150ºC, the sensor can operate up to 300 RPM and can be programmed with full scale output with angles shorter than 360 degrees. Output is selectable between Analog, PWM 12 bits or Serial Protocol (SPI) at 14 bits and includes a second output channel to provide a programmable switch signal. A redundant version with a dual core sensor in the same package is also available. This ultra-miniature MTS 360 Rotary Position Sensor is ideal in optical imaging stabilization and precision biomedical devices, optical zoom devices, consumer electronics, instrumentation, HVAC systems, automotive control systems, marine controls, fork lift trucks, farm equipment, cranes, low speed motor feedback, valve position sensors and robotic and automation feedback system. WIMA DC-Link capacitors are especially designed for applications in high power converter technology where due to increasing electrical requirements they are more and more substituting electrolytic capacitors. Manufactured with a low loss polypropylene dielectric they show a higher current carrying capability as well as lower dissipation/self-heating at high frequencies compared to electrolytic capacitors. WIMA DC-LINK MKP 4 capacitors with rectangular case are available with capacitance values from 2µF through 150µF and with rated voltages from 600VDC through 1300VDC. For mounting purposes 2-pin and 4-pin versions are possible (plate versions on request). WIMA DC-LINK MKP 5 capacitors in cylindrical plastic case are available with capacitances from 16µF through 260µF and with rated voltages of 500VDC, 700VDC, 900VDC, 1100VDC and 1300VDC. They are provided with tinned wire terminations for PCB mounting. WIMA DC-LINK MKP 6 capacitors have a cylindrical aluminium case. They are available with capacitances from 165µF through 1560µF and with rated voltages of 600VDC, 700VDC, 900VDC, 1100VDC, 1300VDC and 1500VDC. For bus bar mounting they are designed with M6 screw terminations and M12 screw bolt. WIMA DC-LINK HC capacitors which based on their internal construction and their non-polarized connection configuration can for example be connected as one 4500µF/400VDC, as two 2250µF/400VDC or alternatively as one 1125µF/800VDC component. Depending on the case size and wiring version values between 85µF/1600VDC and 4500µF/400VDC are available. Customized solutions can be realized on demand. Based on their internal construction and their non-polarized connection configuration WIMA DC-LINK HC capacitors can for example be connected as one 4500 µF / 400 VDC, as two 2250 µF / 400 VDC or alternatively as one 1125 µF / 800 VDC component. Depending on the case size and wiring version values between 85 µF / 1600 VDC and 4500 µF / 400 VDC are available. The capacitors are wound with a metallized Polypropylene film and boxed in a solvent-resistant, flame-retardant plastic case sealed with resin. Cases with screw fixing are optional. The new WIMA DC-LINK HC range is used in intermediate circuit applications of power electronics replacing electrolytic capacitors e.g. in DC intermediate circuits with increased voltage and/or switching frequencies of the inverter. WIMA has extended its range of SMD film capacitors with PPS (Polyphenylene-sulfide) dielectric. Capacitance values up to 6.8 µF and voltage ranges up to 1000 VDC are now available. WIMA SMD-PPS capacitors have an operating temperature range up to +140°C and stands out for their stable capacitance and frequency behaviour versus temperature. All WIMA SMD capacitors are produced with the proven box technology showing a safe protection against mechanical and thermal stress during processing and application. TAW is now distributing resistors from RIEDON which is a 40 year old, Los Angeles based manufacturer of wirewound, thin and thick film resistive solutions. In 2005 RIEDON has acquired the Germany based POWERTRON, a global leader in power and precision foil and also thick film resistors. SFI Electronics Technology Inc. has developed a new ESD protector with ultra-low capacitance (0.05pF typical) in the special small size code 0402. The new series meet the ESD protection requirements of IEC 6100-4-2 level 4 and withstand more than 2000 times ESD sparks. Usage is in HDTV, HDMI, Setop box and high frequency applications. The new device can support more than 5GHz frenquency. American Opto Plus' E27B-7W is specially designed to retrofit into standard E27 fixtures and housing. Each of the lamp features 7 One Watt 70 Lumens LED with enhanced optics to achieve the highest light intensity. In addition, the aluminum housing makes the heat disspation more effective. The E27B series is a cost-effective solution for designers who want to quickly take advantage of the technology. Available in 6000K White, 3200K Warm White, 623nm Red, 535nm Green, 470nm Blue and 592nm Amber. Brightness range up to 490 Lumens per device. Price increase at WIMA's capacitors with 5% tolerance in PCM 2.5 mm. American Opto Plus has released two new 2007 Shortform Catalogs. You can download the PDF files by clicking on below links.